You are currently browsing the Dublin Event Guide weblog archives for September, 2016. This week I changed my “work flow” but then suddenly a HUGE amount of free events turned up and the best plan to send this e-mail magazine sooner than normal was turned on its head. Some great events (I have found more than 230 this week!! Canalaphonic and the Dublin History Festival are the biggest this week. But there is lots more! The month is now nearly over, but I still need EUR 60 to cover the bills for September. Not looking good this month!? I need your help with that, so if you can help in any way, your help will also be VERY much appreciated!!! Make a difference here! Today’s Feel Good Slot quote is an Anthony Robbins quote again and I might post a few more from him in the next few months, because I will go to his Unleash The Power Within (UPW) event in London in April next year and I will probably not be able to hold back from sharing a few bits with you. 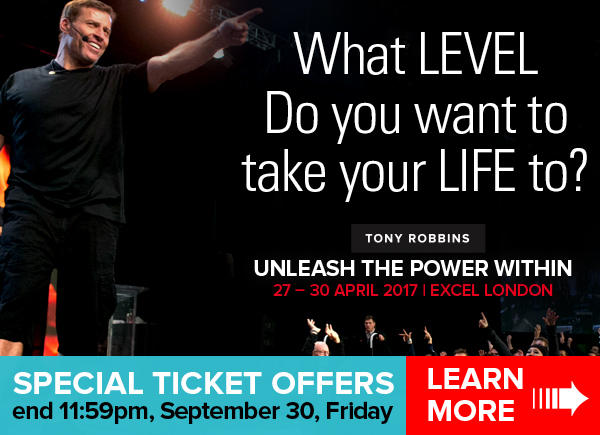 I know that lots of people would love to go to Anthony Robbins events, but they do cost a bit of money and the event is in London. But if you do want to go, then book before the 30 September. Afterwards the price will go up by GBP 200!! Shoes, Boots, Trainers and more from Schuh Ireland. Delivery is free on orders over EUR 25 or if you collect in store. Last week Grainne O’S, Edita M and Joan S were so great to help the Dublin Event Guide with a donation! Thanks a lot! I really appreciate your help! Please keep in mind that without donations there won’t be a Dublin Event Guide (for Free Events): Your donation will ensure that the Dublin Event Guide will continue arriving in your Inbox every week and every donation will benefit EVERY Dublin Event Guide reader! David D, Sillybilly.ie, Elaine M D, Mark C, Shane W, Eddie R, Anne H, Comet Records, John F, Margaret W, Joan S, Nora O’K, David O’K, Tara R, Majella M, Trevor J, Noelle H, Keeva H, Geraldine H, Meav Ni M, Brendan M, Lilian R E, Jutta B-S, Brian H P, Elaine K, Emeline J, Melanie B, Eimear McG, Anita W, Peter W, Catherine G, Darragh J D, Arthur D, Martin O’S, Catherine E, Irene C, Ann M, Mark G, Bridget W, Scott P, Sean S, Paul McE, Patryk R, Melanie M, James R, Zelie McG, Nicole W, Dara MacD, Leslie C, Tania Z, James B, Siobhan M, Barbara Q-B, Eric C, Sueanne O’H, Patrick H, Kay G, Danny C, Clodagh O’C, Elizabeth M, Eibhin C, Sara B, Juliana AY, Pauline R, Eva M, Laura S, Sophie P-L, Seamus C, Christiane B, Aine G, Donna M, Siobhan P, Susan B, Sharon K, Michele McN, Elena W, Melissa C, Michael D, Tony B, Sandra Sch, Bill G, Catherine OS, Tim O’N, Geralidne G, Therese O’R, Pascale N, Louise F, Brendan M, Gareth G, Martina B, Deirdre C, Gennadii N, Rachael McC, Fiona D, Caroline M, Mark G, Colette T, Kathrin L, Ornaigh G, Krisztian V-D, Stephen L, Eamon S, Tom McI, Marsha S, Aishling B, Ana R T, Ciara M, John L, Nicola R, Mary O’N, Brendan O’B, Bruce F, Martin C, Roisin R, Olga F, Caoimhe NiM, Jessica G, David S, Debbie L, Lica B-B, Aodhagan D, Niamh S, Malachy B, Lorraine C, Stuart N, BCS, Filippo G, Kiera M, Lorna O’C, Elizabeth B, Patryk R, Rolando C, Aidan C, Ann M, Anita W, Ryan M, Clodagh O’C, Michele McN, Adam J, Marie C S, Colm D, Niamh D, Sean E, Belinda B, Cristina B, Pat M, Matija H, Rita B, JB M, Maria F, Endija S, Catriona D, Ailish B, Leigh P, George K, Miriam L, Mona O’R, Helen B, Justin M, Susan F, Deirdre G, John F, Melanie B, Mark G, Martin O’Malley, Andrew G, Ornaigh G, Noel N, Serena F, Eamonn U, Gerard Ph, Fiona F, Gabriel K, Aislinn T, Barry M, Trudi C, Eugene G, Marc F, Susan H, Grainne O’S, Edita M, Joan S and Arthur’s Pub (www.arthurspub.ie A classic Dublin old-style pub in 28 Thomas Street with a new and buzzing music venue that runs lots of events), the Speedfriending Ireland Meet-up Group (www.meetup.com/Events-Drinks-Talks-Dublin/) (Where you can meet lots of new people and make friends), the Birdcage Bakery & Cafe (www.facebook.com/BirdcageBakery An independent cafe and bakery in 23 Harcourt Road, Dublin 2), Cycling Campaign (www.dublincycling.ie), www.FlamencoIndalo.com (A group that supports and promotes the art of Flamenco in Ireland), www.oliviercornetgallery.com (An Art Gallery in 5 Cavendish Row), www.thepaulkanegallery.com (A great Art Gallery, on the search for a new venue), www.cfcp.ie (The Centre for Creative Practices is the the only arts centre in Ireland dedicated to connecting, integrating and promoting immigrant, experimental and emerging artists among the local arts scene and audiences) and www.KravMagaIreland.com, the self-defence training centre for everyone, which provides regular 12-week or 2-day self-defence training courses for beginners. This weekend the highlights are definitely the Canalaphonic Music and Culture Festival with focus in Rathmines (but also in Whelan’s) and the Dublin History Festival in Dublin Castle. But also keep in mind that it is the last weekend for the current Science Gallery exhibition SEEING. It will close on Sunday, so your last chance. A less obvious pick is the open day at the Dublin Society of Model and Experimental Engineers (DSMEE) in Marlay Park. For model railway renthusiasts this is a must! During the week, check out Probe (next Friday) and the History events for the Dublin History Festival are continuing. Not just one but two amazing shows are coming to Dublin in November. “Alice in Wonderland on Ice” and “Dracula on Ice” will be performed in the National Show Centre by Russia’s Ice Vision performers from 24-27 November and it will be a unique opportunity to see these professional Russian Skaters performing the shows. Ice Vision is based in St. Petersburg and they will be the very first time in Ireland. Have a look at the Dublin News section this week, to find out even more. Tickets are already available on Ticketmaster and I expect that this event will sell out soon because it is so unique. Go to www.ticketmaster.ie/Alice-In-Wonderland-On-Ice-tickets/artist/5200464 to find tickets for Alice in Wonderland and to www.ticketmaster.ie/Dracula-On-Ice-tickets/artist/5200466 to find Dracula on Ice tickets. The organisers of these two events gave me a pair of tickets for the “Alice in Wonderland” show and if you want to win this pair of tickets, you will have to send a mail to dublineventguide@gmail.com with ALICE in the subject line and with your name and mobile phone number in the body of the mail. In addition you need to include the name of the city where the Ice Vision Production Company is based. Your mail has to be with me by 05 October. Two ice shows are coming to Dublin in November and you will probably start hearing about them soon. The production company is Ice Vision from St. Petersburg and to enable them to bring their shows to Dublin, the local organisers (www.mcaevents.ie) specially have to build a professional ice rink. They will do that in the National Show Centre in Swords and the shows “Alice in Wonderland on Ice” and “Dracula on Ice” will be performed in the National Show Centre from 24-27 November. By the way: You might wonder why they couldn’t just use the technology that our Christmas Season ice rinks in Dublin use every year!? The reason is that professional ice skaters for a high performance show need ice that is a lot colder and therefore harder than the normal hobbyist ice rinks. That’s why they will bring truck loads of equipment to Swords for just four days. Russia’s Ice Vision production company is using a huge video background scenery in which the ice skaters then move around. The Musical arrangement for both productions has been created by Petersburg composer Alexey Galinski who has also composed for shows “Princess Anastasia” and “The Nutcracker and the Dark Lord”. Alexey was also the composer of “Olympia”, written for the figure skating demonstrations at the Sochi 2014 Winter Olympics. Tickets are available on ticketmaster.ie (look for “Alice on Wonderland on ice” and “Dracula on ice”) and you can even win a pair of tickets in the Competition section of this Dublin Event Guide. Only one programme about Dublin, but a few more interesting ones from other parts of Ireland. However, I was surprised reading what will be covered. They don’t all sound like the “greatest building and engineering achievements”. Kilkenny Castle? Dublin’s Distilleries? And the oddest one: “Kerry Tourism”? Is that really the best there is? Are you using social media to plan and publish your events, but are too busy to read up on all the little updates that might or might not affect you? Eventbrite has summarised the seven biggest recent updates for you. So that you won’t lose touch but can focus on what is important for you. The Dublin Festival of History will take place from Friday 23 September until Saturday 08 October. There will be plenty of talks in the Printworks Conference Centre at Dublin Castle and in Dublin’s Libraries about a large range of different topic. Admission is free, but some events require pre-booking. The full programme can be downloaded here or you can check the website below for more information. Sculpture in Context is Ireland’s largest outdoor sculpture exhibition and it is a brilliant exhibition in the beautiful surroundings of the National Botanic Gardens. Some of Ireland’s best artists are showing new work and the sculptures are displayed throughout the gardens, ponds, Great Palm House and Curvilinear Range, with the smaller works exhibited in the in the gallery in the Visitors Centre. The exhibition opened on 08 Sept and will run until 21 October. “Eid in the Park” will be an event on Saturday in St. Patrick’s Park next to St. Patrick’s Cathedral. “Eid” is a muslim festival. The last day of Ramdan is called “Eid al-Fitr” and a second holiday in the muslim calendar is “Eid al-Adha”, the Feast of the Sacrifice. “Eid in the Park” is a family-friendly festival, organised by the humanitarian organisation Human Appeal and the community organisation South Dublin Maktab from Lucan and a muslim school (Shohada School) to share their festival with the rest of Dublin. There will be stalls with food and children entertainment and admission is free. A Family and Children’s Programme will be provided outside the Printworks at Dublin Castle as part of the Dublin History Festival. It is a day of drop-in, interactive, historical fun for all the family. An Intercultural Tour in Chinese Language with Community Ambassador Vicky Wang will take place. Admission is free. Former rugby player, manager and commentator Donal Lenihan will sign copies of his auto-biography “My Life in Rugby”. Six times will the “People’s Art 2016″ exhibition take place this year. It is an art exhibition on the rails/fence of St. Stephen’s Green. Visiting the People’s Art Exhibition is free and you will be able to admire (and buy) a huge amount of art works. The event starts close to 11:00 and typically finishes around 17:00, it runs from Friday until Sunday with the main activity on Saturday and Sunday. People’s Art Dublin is a voluntary, part time, non profit making group, brought together by Dublin City Council to promote the visual arts to the public of Dublin. A huge variety of art/paintings are displayed and if the weather is nice it is a great art-filled stroll around Stephen’s Green. Definitely recommended! Journalist and broadcaster Olivia O’Leary will be in conversation with the Dunnes Stores strikers fromt he Strike against Apartheid in 1984 to discuss the motivations for and consequences of their strike action, which began in July 1984 and lasted for 2 years and 9 months. Asperger’s Syndrome is a developmental disorder that affects thousands of people in Ireland today, however, it is greatly misunderstood and often confused with other conditions. On Saturday, with support from Aspire Ireland, Dublin Castle will host a panel of “legends”, assembled to share their stories of living with the condition and help us to dispel the myths that surround it. They will talk about their day-to-day experiences as well as what they would like us to know, with the opportunity to ask questions. Admission is free. It seems that booking is not required, but I can’t say that for certain. So, maybe just arrive and ask nicely if you could join. The Canalaphonic Market Fair will be back, but not on Portobello Harbour Plaza, instead it will be near this year’s Main Stage at the Leinster Cricket Grounds. You will find Vintage Clothing, Vinyl Records, Jewellery, Arts & Crafts and Sweet Treats at this market. The hugely popular Oktoberfest in Dublin takes place from 15 Sept – 02 Oct again. It is a German Beer Festival with Erdinger Weissbräu Beer (including alcohol-free wheat beer), lots of German Bavarian Food and authentic Bavarian music. Opening hours are Mon-Wed 12:00-23:30, Thur-Sat: 12:00-00:30, Sun 12:00-22:30. The best place to experience the festival is in the Festival Tent on the platform in George’s Dock. But because the yearly festival is soo popular, there are at times long queues due to severe admission restrictions (quantity of people). Last year the queues already started at 17:30. Luckily around George’s Dock are more food and drink stalls so that you don’t HAVE to be in the Festival tent to enjoy the event. Admission is free, but after 22:00 an odd meal voucher system kicks in: You will have to buy a wristband for EUR 6 that gives you a food voucher if you want to buy any alcohol. Allegedly licensing rules force them to do that. Canalaphonics is a free Music and Culture Festival that with its centre in Rathmines, but with additional events in Wexford Street and the Earlsfort Terrace area. It will take place from Friday 23 to Saturday 24 September and there will be more than 100 acts on 25 stages. Saturday: St. Mary’s Choir (14:00), The Bonnymen (15:00), AE Mak (16:00), Mick Pyro (17:00), Sample Answer (18:00), Zaska (19:00) and Rocstrong (20:00). Other participating venues are Whelan’s, MART, Abner Brown’s, The Vaults, 34 Lennox Street, Lock 6, Graces, The Bernard Shaw, Harbour Playhouse, Isabella’s Ice Cream, Alan Hanna’s, Rathmines Library, Two Fifty Square, Moda, MVP, Mother Reilly’s, Rody Bolands, Copan, Slattery’s, Blackbird, The Barge, Opium. All gigs and events are free. You can download a PDF with the schedule here or check the website where all venues are listed here with their line-ups. Guide Patricia McCabe will lead an In Focus Tour about “Chinese Religion and Culture”. The “Spirit of Dunboyne” is a motoring event, organised by the Dunboyne Motor Club, that will this year run for the 10th time. It will start on Saturday with Fun Run for classic cars and bikes from 13:00-16:00 along a route through parts of Co. Meath and Co. Kildare. with a start and finish in Dunboyne. Participation costs EUR 10, but watching it is free. From 20:00 on Saturday a 50s/60s Rock ‘n’Roll night will happen (see separate listing). The 5th March for Choice, organised by the Abortion Rights Campaign, takes place on Saturday. Meeting point is at the Garden of Remembrance on Parnell Square at 13:30 and at 14:00 the March to Dail Eireann in Kildare Street will start. The theme of the March this year is “Rise and Repeal”, which refers to the failure of the Irish Republic to fulfil the promise of equality made in 1916. The Royal Horticultural Society of Ireland’s Dahlia Show will be back in the Botanic Gardens. The show will be in the Teak House on Sat from 14:00-17:00 and on Sunday from 10:00-17:00. The Europe Direct Information Centre, Blanchardstown Library and the European Commission Representation in Ireland will host the European Day of Languages 2016. The event will be a Language Café offering 9 languages: Irish, French, German, Spanish and Italian as conversation and Polish, Romanian, Lithuanian and Latvian as Taster Classes. It will start at 14:00 and refreshments will be served afterwards. During World War II, enigmatic Irish-German woman Erina Brady brought modern dance to Ireland from Germany. This film brings five of Brady’s former tiny tots on an odyssey to a bygone era in her enchanted Irish School of Dance Art studio. Produced, written and directed by Deirdre Mulrooney with original score by Rossa Ó Snodaigh (Kila). The film will be followed by a discussion and Q&A with the director. “A Royal Pageant” with Jo May is the family workshop for 4-10 year olds and their guardians. Admission is free and all details are on the website below. Creative Writing Workshops will be offered by three libraries in Dublin. The workshops are free and over four weeks mentors will guide you through the basics. The Central Library are running the workshop on Saturdays from 24 Sept – 15 Oct (15:30-16:45). Raheny Library will start in November. Check out the website below if you are interested. Booking is required!! Every Saturday during the Sculpture in Context exhibition (10,17,24 Sept + 01,08,15 Oct) you will have the opportunity to meet one of the participating artists for a guided tour through the exhibition to gain an insight into Ireland’s largest outdoor and indoor sculpture exhibition. Admission is free. Meet at the Education and Visitor Centre. The Spirit of Dunboyne is a Motor Sport/Bike & Car event in Dunboyne this weekend (see separate event listing) and on Saturday they will all assemble in the Marquee at Brady’s Lounge for a 50s and 60s Rock ‘n’ Roll night with live music from Bee Bop Gold. You are invited to wear your 50s/60s outfit and there will prizes for the best costume. Admission is free. Dunboyne is about 20km from the City Centre of Dublin via the N3. The Hardchargers will play Blues, Rock and Roots in the Harbour Bar. Feather will play futuristic Afro-Soul with her 7-piece band. + Johnny Ward, a Beatles Cover Show on Sunday. The band from The Last Waltz bring bring The Irish Rock Show to the Purty Kitchen in Dun Laoghaire. Celebrate Ireland’s best exponents of rock: Rory Gallagher, Phil Lynott, The Pogues, Sinead O Connor, Van Morrison, Horslips and many more. Ditch Cassidy, one of Ireland’s best Blues singers, will be in the Salty Dog on Saturday for a gig. There are soo many DJ events in Dublin, that I normally don’t get a chance to include them unless there is something special about them. The “Interstate” event has some special and interesting theme. It is a trip through the USA from city to city and every week a different DJ will play songs just from that week’s city. Admission is free before 22:00 and EUR 5 after 22:00. A U2 Fan Party with Tribute Band U2 Baby will happen in the Church Bar on 23 and 24 September. The Pacifics will play a gig in the Mezz at midnight. Finally, this year, there will be guided tours at the Fort for three months from 31 July until the end of October. The tours take place on Sundays and Fridays at 10:00, 12:00, 14:00 and 15:30 and only 20 places are available on each tour. The Kilkenny Shop Cafe is inviting to a Jazz Brunch Sunday every Sunday. They don’t specify who is playing at the brunch, I will see if I can find out more. The Dublin Society of Model and Experimental Engineers (DSMEE) is inviting you to an Open Day at their facilities in Marlay Park. It will be on Sunday from 11:00-17:00 and they will show their great work. Trains will run on both the raised track, where the normal Saturday train rides for children are run, but also on the larger ground level layout, located next to the main DSMEE building.The ground level track is 800m long and 400 of it are used. The levated line is 280 meters long. Sounds like a dream of every model railway hobbyist! Locomotives and other items built by the society’s members will be on display and there will be people to tell you more about the DSMEE (and you can join them if you are interested). This is the very last day of the SEEING exhibition in the Science Gallery, go today if you still haven’t seen it!! The main day for the “Spirit of Dunboyne” event is on Sunday. There will be parade laps with Classic Bikes and Cars, Demo Laps by Sidecar Motorbikes, Formula Libre Cars and Rally Cars and there will be Pit Bikes, Slot Car Racing and Auto Test Demonstrations. Entertainment for kids will also be available. Dunboyne is about 20km from the City Centre of Dublin (via N3) in north westerly direction. The next concert will feature The Clementi Sonatas VII with Fionnuala Moynihan piano. The Dún Laoghaire Tribute Music Festival is a free gig of tribute artists in the centre of People’s Park. Fans of Bruce Springsteen, Fleetwood Mac, Oasis and The Andrews Sisters will hear tribute acts copying their idols. The bands are Mad Fantastic, Mack Fleetwood, Roll With It, Bugle Babes. A Intercultural Tour in Japanese Language with Community Ambassador Hiromi Anzai will take place. The Lucan Concert Band will perform in the bandstand of Farmleigh House. Lar Joye, curator of Military History, in a talk examining the Battle of the Somme, including stories of the 10th Royal Dublin Fusiliers from the Royal Barracks Dublin (now Collins Barracks). Admission is free and no booking required, places will be allocated 15 minutes before the talk begins. Breizheire, an organisation for Breton Culture in Ireland, is inviting to a Breton Dance Session on Sunday. Brittany, the celtic region in France, has a rich culture of folk dances and the accompanying music and at this Breton Dance Session in Dublin, you can take part and/or watch. “Seeing the Painter-Engraver’s Art – Original Print Exhibitions in Ireland 1880s-1920s” is a free talk with Dr. Angela Griffith, TCD in the National Gallery. Come to this family friendly tour of the “Proclaiming a Republic: The 1916 Rising” exhibition, looking at some of the highlights of the Museum’s extensive Easter Week collection. Admission is free and no booking required, places will be allocated on a first-come first served basis 15 minutes before the tour starts. “Not Quite Mass” is a new weekly Comedy show in the Workman’s Club. There will be stand-up comedy and more (games, interviews, panel discussions and some madness). The event is organised and lead by Steve Bennett. The first “Note Quite Mass” will be this Sunday and the line-up should be on the Facebook Group Page below. Admission is free (donations are welcome). Admission is free, but tickets are required. Get them via the website below. The Rock ‘n’ Rockk and Swing Band “The Jive Cats” will perform in the Mercantile every Sunday from 22:00. The Surefire Trio will play a gig in the Mezz on Sunday. From Monday 26 Sept until Saturday 01 Oct, a Social Inclusion Week will take place in Dublin. The purpose of this week is to raise awareness of both social Inclusion and exclusion as it affects the lives of communities, families and individuals. There will be a series of events and activities during the week and many of these events are organised and delivered by groups at risk of social exclusion including migrant groups, people with disabilities, homeless and the LGBT groups. Admission is free to nearly all events. The downloadable PDF brochure with all events in it can be found here. An exhibition of wild mushrooms will be shown at the National Botanic Gardens. Bring in your gathered mushrooms, meet and talk with mycologists to share experiences and learn more about the huge variety of fungi in Ireland. The Simon Community seminar “Housing, Homelessness and Rights” will focus on “the importance of enshrining rights at the heart of our policy, practice and legislative processes to ensure there are meaningful changes in the lives and experiences of people who are homeless and those living on the edge”. Ulster Bank is running a business seminar about “Achieving Sustainable Growth” where you can meet other entrepreneurs and business owners and hear about the challenges and opportunities facing Irish businesses including establishing and growing a business, policy issues and supports for SMEs. Admission is free, but registration is required via the Eventbrite site below. The ‘emergence’ of children and childhood in modern history with Marnie Hay. Our modern conception of childhood as a time of education and innocence began to emerge in the eighteenth century, but it wasn’t until the late nineteenth and early twentieth centuries that such ideas influenced the lives of children of all classes in the western world. How and why did this happen? Marnie Hay is a historian whose current research relates to the history of Irish nationalist children and youth in the early twentieth century. The Italian movie “Il Vento fa il suo Giro” will be screened in Italian with English subtitles. Admission is free, but booking is requried via the website below. Richard O’Carroll was a trade unionist and Labour Party councillor on Dublin City Council, first elected in 1907. He was killed by Captain Bowen-Colthurst during the 1916 Rising and was the only elected member of the Council to be killed while on active service during the Rising. Brian Hanley will give this lecture. He has taught and published widely on twentieth-century Irish history. The Irish Astronomical Society is inviting to the talk “Amateur Radio Satellites and receiving live video from the orbiting ISS” by Daniel Cussen. Donal Kirk and Mal O’Brien are playing music from Lowell George Little Feat, Bonnie Raitt, Free, Bad Company, Crosby, Stills & Nash, Beatles, Bobby Bland, Vince Gill, Ray Charles, Etta James, Elvis, Ry Cooder, Dobie Gray, Guy Clarke, early ZZ Top, Dave Edmunds, Stevie Ray Vaughan, Willie Nelson. The free lecture “Why Artists Make Prints” with Artist Printmaker Niall Naessens will take place in the National Gallery on Tuesday. Historically themed films including two films on French history will be screened in the Pearse Street Library. All films will either be in English or will at least have English subtitles. The screenings will be at 14:00 on Tuesday 27, Wednesday 28 September, Tuesday 4 and Wednesday 5 October. “With their drums and their guns: Irish Soldiers & their Music in the American Civil War” is a talk with Brendan MacQuaile about the approximately 200,000 Irishmen who fought in the American Civil War, 1860-64, most of them in the Union Army. Listen to their stories and songs with Brendan MacQuaile. Brendan is a classically trained baritone who has performed widely in Ireland and abroad. “Modern Dilemmas” is a reflective talk series exploring dilemmas in modern life & relationships. The speakers are sharing a struggle and some insights but are not coming at it from an expert position. The 1st talk theme is “changing how i work” with two speakers, Matt a doctor & John an entrepreneur. “The USSR through Irish eyes: Irish Republican women and the Soviet Union” is a talk with Maurice Casey. At the beginning of the 1930s several boats left Dublin bound for Leningrad, populated with some of Ireland’s best known women radicals such as Helena Molony, Hanna Sheehy-Skeffington and the veteran suffragette Charlotte Despard. What brought them to Russia and how did it effect them? This lecture makes use of new material from archives in Dublin, Britain and Russia, much of which has never been discussed before. Maurice Casey is a graduate of Trinity College Dublin and Cambridge University. His research focuses on the global connections of Irish radicals during the twentieth century, with a particular focus on the Soviet Union. Commandant Stephen Mac Eoin (Irish Defence Forces Director of the Military Archives) will discuss collections relating to the 1916 Rising in the Military Archives including the various genealogical sources available with reference to the Irish Citizen Army, Cumann na mBan, Na Fianna Éireann and Dublin Brigade Activity Reports. This is a weelly acoustic roots and blues session every Tuesday in Arthur’s Pub. With Anthony Mannion(Guitar/vocals) and Luke Mercer(Guitar/vocals). Admision is free. CONNECT16 is a showcase of and for the events industry featuring over 220 hotels, venues and event suppliers, tastings per region, entertainment and 30 educational seminars. It is for everybody who is organising events of any sort as your normal occupation. Admission is free but booking is required via the website below and that’s also where you will find a lot morer information about this event. Taking inspiration from the historical architecture of Dublin Castle, join artist Doireann Ni Ghrioghair in an experimental sculpture workshop for adults. Using photography to investigate the various forms, shapes and motifs, 3D constructions will be made that riff and improvise with the visual language of the building. Dublin City Public Library and Archive Services) will take place on Wednesday in the Seminar Room of the National Library. Margaret Hayes was appointed as Dublin City Librarian in July 2010 with responsibility for Library, Archive, Gallery and Museum services. A Let’s Walk & Talk tour will take place in Kilmainham and at the National War Memorial Gardens in Islandbridge. Meeting point is outside the former Courthouse at Kilmainham Gaol. The walk will be led by historian Pat Liddy. The Temple Bar “Night” Market is more an afternoon and evening market (15:00-20:00) and it takes place every Wednesday until the end of September. “The British popular press and the new Irish Free State” with Elspeth Payne is a talk on Wednesday. It will look at how Anglo-Irish relations were renegotiated in the pages of the British tabloids in the early years of Irish independence and examines the place of these publications and their discourses in contemporary British and Irish societies. Elspeth Payne is an Irish Research Council funded doctoral candidate in Trinity College Dublin and former recipient of the R. B. McDowell Fellowship. Her research explores Ireland’s relationship with the British popular press between 1922 and 1933. “Empty teacups: Living without Tea in WWII Ireland” with John Porter will look at how during World War II Ireland’s national drink, tea, became a scarce and highly sought after commodity. This talk explores how Irish society reacted to the traumatic absence. John Porter is a PhD candidate at Trinity College Dublin. The International Mandolin Composition Competition will conclude with the Award Ceremony for the “Nino Lammarino” award. The event will feature musical (Mandolin) performances by the winners. As part of the Easter 1916 commemorations the decision was made to conserve the surviving 1916 Dublin garrison flags for display in the National Museum. However during the course of the work a remarkable discovery came to light from Enniskillen. This presentation will outline the different types of flags used by the rebels in 1916 and the work that was undertaken to authenticate the Enniskillen flag together with the conservation process. Rachel Phelan graduated from the Textile Conservation Centre in 1998 and in 2002 she established her own studio. Poetry Ireland and Carcanet Press invite you to the Dublin launch of Mary O’Malley’s eighth collection of poems “Playing the Octopus”, with special guest Joseph O’Connor. Admission is free, but booking is required via the link below. If you are based in Fingal, then the Business Advice Clinics in Blanchadstown Library on Tuesdays and Thursdays might be interesting to you. Find out more detail via the link below. Smashing Barriers is a get-together for disabled people, where you can find your voice and work with an artist to create something together. All you need is an interest in change in your community and time to get involved. The event is organised by the Ballyfermot Access Group. The event will happen at 11:30-13:00 and another group will meet at 18:30-19:30. Light refreshments will be provided. Admission is free, but booking is required via Catherine Lane (01-623 8088 or clane@ballyfermotpartnership.ie or text 087 909 2837). Engaging anecdotes, stories and images will feature at this talk about the history of Dublin in the twentieth century. Tim Carey is Heritage Officer of Dún Laoghaire-Rathdown County Council and has published many history books. By 1941, the German Embassy in Spain was the Reich’s largest, with 500 people working in Madrid and 42 consulates on Spanish soil. Why did the Nazi regime devote such attention to a technically neutral country? This lecture will explain the reasons behind this phenomenon through the analysis of the German propaganda campaigns designed for Spain. Dr Mercedes Peñalba is an Irish Research Council Postdoctoral Fellow at the Centre for War Studies, University College Dublin. Her work focuses on the design of Nazi propaganda for Spain during World War II. The Lunchtime Lecture “A Revolution is Not a Dinner Party: the 1911 Chinese Revolution in the Context of the 1916 Rising” with Dr Isabella Jackson (Assistant Professor in Chinese History, Trinity College Dublin) will take place. Colm O’Gorman, Executive Director of Amnesty International in Ireland, Sinead Hogan, Lecturer School of Creative Arts IADT, and artist Alan Phelan will reflect on Roger Casement’s role as a humanitarian, current human rights issues and how artists respond to these themes in their practice. Two Conversation Cafes will take place in Cabra Library. The first on Thursday 29 September and teh second on Thursday 13 October. Seán Connolly was in command of the City Hall garrison on Easter Monday 1916. Hear the story of this Dublin Corporation employee, Irish Citizen Army captain and the first rebel to die in the Rising. Donal Fallon is a historian with a particular interest in the history of Dublin. He is one of the founders and contributors to the Come Here To Me blog. The next series will take place on Thursdays from 18:30-20:00 between 15 September and 20 October. A public lecture about the US Presidential Election will take place in TCD. Speakers will be Dr Paul Scanlon (“Economic Trend and the Rise of Trump”), Dr Constantine Boussalis (“Implications of the 2016 US Election on Climate Change Policy”), Dr Peter Stone (“Moral Collapse in the 2016 U.S. Presidential Election”) and Dr Laura Graham (“Whose vote counts? Race, class, and gender in the 2016 US Presidential Election”). Admission is free, but there is a huge amount of interest for this event and once the lecture thatre is full, you won’t get in. It will be filled on a first come, first served basis. A Ladies Night for Polish Women will take place at the Polish Library. There will be Polish live music, an art exhibition and presentations/discussions about fashion, make-up or diets. “The Ireland Korea Parallel: Reflections on our Shared Experiences” by Dr Eamon McKee (Ambassador / Director General of the Dept of Foreign Affairs and Trade, Ireland). Ambassador McKee has been posted to all of the diplomatic hot-spots that exemplify Ireland’s high-profile global role. First he was involved in the Irish peace process talks, then was in Korea (serving both South and North Korea), then in Israel, and now as the Director General of Ireland’s international trade. He will speak about interactions between Irish people and Korea from the 19th century onward, colonisation and independence, partition and peace building and modernisation (the swift transition in both cases from a rural and agricultural based society to an industrialised/urbanised/ and now digital one. It takes place every Thursday and admission is free. Astronomy Ireland is inviting to a “Farewell to Saturn & Mars” event for which they will set up an array of big telescopes on Thursday. Saturn and Mars were visible on our skies for the past few months and they are both leaving us for now. Mars will not come close to Earth again until summer 2018 and Saturn will be back next summer). Come and have a look through the telescopes to get an unforgettable look at these two planets and the moon. The Contemporary Music Centre continues its 2016 Salon Series with Dublin Sound Lab. Dublin Sound Lab is a contemporary music ensemble formed by Michael Quinn (organ) and Fergal Dowling (electronics), specialising in electronic and computer mediated concert performance. As well as presenting existing works, the duo initiate collaborations and use computer based techniques to explore relationships between compositional process and performance practice, and to create new and engaging concert experiences. Rock band Fox Jaw will play a gig in Whelan’s. Brazlian band Namangaia will play Forro music every Thursday in the Mezz. The next Cabin Sessions will take place on Thursday with the Cabin Crew (Christian Volkmann (harmonica), Cathy McEvoy (fiddle), Dave Hardy (sax), Spats Davenport) and with guests Capo Two (folk), Sean Mc Comish (Contemporary) and Charlie Roth (Americana) from the USA. A live music open mic session, called “Keep on Trucking” takes place every Thursday in Peadar Brown’s Pub, it is presented by Joey Magic. The Swing Cats will be in The Church for a gig and admission is free. Expect up tempo hits from the swing dance era of the 1940’s and 50’s, featuring hits from swing music legends such as Bobby Darin, Louis prima, Louis Armstrong, Frank Sinatra and The Rat Pack. Students of the Dublin Adult Learning Centre and poet in residence Nessa O’Mahonywill read poets in the Irish Writers’ Centre. Admission is free and more information is available on the website below. The Public Lecture “The Deep Roots of Rebellion: Evidence from The Irish Revolution” with Dr Gaia Narciso, Assistant Professor of Economics, Trinity College will look at the findings of a recent study by Dr Narciso and Dr Battista Severgnini of Copenhagen Business School, which explores whether the Irish Famine (1845-1850) changed political attitudes and contributed to the Irish Revolution (1913-1921). To celebrate the 7th Indian Film Festival of Ireland, Pearse Street Library is screening ‘Haider’, a 2014 Indian crime drama film directed by Vishal Bhardwaja. The film received many nominations and won five National Film Awards. Admission is free, but a booking via Eventbrite seems to be required. However, when you check the description in detail then it says “register for updates”. That suggests that the Eventbrite registration here is NOT for any event, but it is just to join an e-mail list. Most events take place on the TCD Front Square and no booking is required. And if you go to the Probe Facebook page, you find in the Photos section snap shots of the full event schedule for the event. “Di Concetta e le sue donne” is a theatrical performance of a novel by Maria Attanasio, performed by Italian performers. Find all details via the website below. Admission is free according to the website. Flying South is a mental health open mic event, organised by a spoken word collective that is also called Flying South. All types of spoken word are welcome – poetry, performance, storytelling, comedy, drama, songwriting, anecdotal sharing, etc. – if you have something to say about mental health, want to share your own story, or just want to come along & watch, everyone is very welcome. There will be baked goods and teas/coffee. If you would like to perform or read on the night, just turn up & put your name/act on the signup sheet. Nicole Rourke, Karl Parkinson, Dylan Harcourt & special guests are already on the line-up. After the Ibis will play Reggae and Roots on Friday. The U2 Tribute Band “Rattle & Hum” will play in the marquee behind Baker’s Corner for their 30th Birthday on Friday. On Saturday, there will be Bungee Jump (is that actual bungee jumping or a band!?!?!) and “Smash Hits” will perform and on Sunday “The Juice” will be on stage. The Midnight Hour in Whelan’s will feature the bands Exiles and Chasing Felix. The gig will start at midnight, but you have to be there by 22:30 if you want to get in for free. Another way to get in for free is to sign up for the guest list via the website below. The next walsk are on 11+17+24+25 September + 02+ 09 October. Sugar Drink Tax? Another nonsensical idea of our government! Taxes are raised in Ireland (and most other countries) not to regulate something or to improve something directly related to the taxed item, but for the state to make money. But now our government wants to introduce a tax on Sugar-containing drinks to fight obesity. Well, first of all, I can’t imagine that it will have the slightest impact on obesity. If you buy a bottle of coke for EUR 2 today, then the 20% or 40c increase won’t stop tooo many people from buying that bottle. And if you buy a non-branded 2l bottle of sugar-containing soft drink for maybe 55 or 75 cent then the new price would be 66 cent or 90 cent respectively. Does anybody really think an increase of 11 or 15 cent will change the buying behaviour significantly. Nonsense! Obesity will not be affected in the slightest by these increases. The only area where it could have an impact is in a pub or restaurant where you already pay a very high EUR 3 or more for a small bottle of soft drink. If the 20% increase would apply there than that is a 60 cent surcharge despite the fact that the tiny 0.2 l bottle has much less of an obesity effect than the 11 cent more expensive 2 litre bottle. Odd! Another interesting aspect is a comparison to other taxes: If Sugar Drink tax is raised to fight obesity, then Motor tax and fuel tax should be used to improve the roads or even better to improve public transport, but it isn’t directly tied to either. It also should maybe help to reduce accidents, especially fatal ones. But that is not the case. Alcohol tax (duties) should be used to reduce alcoholism, but that is not the case. Instead it is just pocketed by the state. Why am I so much against a Sugar Drink Tax? Because most of us are well able to either limit our sugar intake or make up for it through exercise. But the government doesn’t suggest that people who are not obese do not pay the tax, instead they plan to raise the tax indiscriminately. Even if you are stick thin, you will have to pay the 20% more. That just doesn’t make sense.